GolfBC Championship, a Mackenzie Tour-PGA TOUR event at Gallagher's Canyon, congratulates 2018 Champion George Cunningham! GolfBC is excited to be back as Title Sponsor (and host venue at Gallagher's Canyon) of the 4th annual GolfBC Championship, June 10-16, 2019. Following the Mackenzie Tour PGA TOUR Canada mandate, the GolfBC Championship is proud of the positive charitable impact it has on the Kelowna area - where over the first three years a total of $400,000 was raised for the BC Cancer Foundation (the designated charity beneficiary of the GolfBC Championship) as well as $50,000 for the Canadian Red Cross (after the devastating floods in 2017). Visit our website for more information and the official press release. Sponsorship opportunities are available for the 2019 GolfBC Championship! 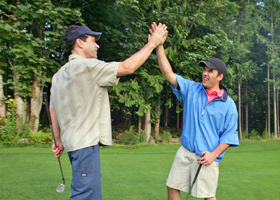 Align your brand with professional golf in the Okanagan. For all sponsorship opportunities, click here. Visit the event website for stories, updates and photos! Follow @gbcchampionship on Twitter or @golfbcchampionship on Instagram, and like on Facebook at facebook.com/gbcchampionship.